It was another beautiful night at Hickory Motor Speedway as it was Cargo Transporters Championship Night presented by Gaston Rentals for all divisions. The night would begin with Todd Harrington leading the 4-cylinders to the green and the #10 of Tim Canipe on the outside front row. It wouldn't take long for Harrington to assume the lead followed by Canipe, the #51 of Nathaniel Kanupp, the #9 of Randy Canipe and the #98 of Robbie Lewis. At the checkered Harrington would take the win and the championship for the 2012 race season rounding out the top 5 would be Tim Canipe, Kanupp, Randy Canipe and Lewis. Mark Whitten would grab his 1 st pole of the year in the WrenchRags Street Stocks and the battle would heat up early. A four car battle for the lead began from lap 1 with Whitten, the #03 of Kevin Eby, the #64 of Marshall Sutton, the #31 of Kenneth Roberts, Donnie Harmon in the #5 would round out the top 5. Caution would fly on lap 3 when the #9 of Kevin Townsend spun on the backstretch. Action would resume where it left off with door-to-door racing 3 deep. Eby would take the lead on lap 6 followed by Whitten, Sutton, Roberts and Harmon. Caution would fly again when the #69 of Trey Buff would spin entering turn 1. Eby would resume the lead on the restart with Sutton following closely behind. Sutton and Whitten would pressure Eby lap after lap looking for an opening. Lap 13 would provide that opening and a door-to-door battle ensued for several laps until Sutton took the lead. Eby attempted a crossover move that was met with a block from Sutton, but Eby would eventually work back to the inside. At the end it was Eby taking the win and the 2012 WrenchRags Street Stock championship followed by Sutton, Whitten, Harmon and Roberts rounding out the top 5. The #55 of Zach Bruenger would get fast time for the Paramount KIA Limited Late Models. Bruenger would take the early lead followed closely by the #00 of Shane Lee the #51 of Jeremy Pelfrey and the #15 Brandon Atkinson. Lap 7 would bring out the caution with contact between the #07 of Josh Bralley and the #15 of Sheflon Clay. On the restart Bruenger would resume the lead but with pressure from Lee and Pelfrey with the #07 of Josh Bralley moving into the battle. Lee reeled in Bruenger with 10 to go as Clay worked his way through the field to 6 th . Caution flew on lap 27 for a spin by the #21 of Adam Congrove on the front stretch. A door to door battle for the lead ensued between Bruenger and Lee. This set up an 8-lap shootout and at the line it was Atkinson followed by Lee, Bruenger, Pelfrey and Bralley. Shane Lee would take the championship in the Paramount KIA Limited Late Models. The #75 of Charlie Neill took the pole in the Red Baron Renegades and the early lead followed by the #64 of Darby Crouch, the #4 of Greg Austin, the #16 of Carroll McKinney and the #14 of Eddie Russ rounding out the top five. Caution could come out on lap 5 with a spin by Austin in turn 2. Caution would fly again on lap 9 with contact and a spin by the #71 of Kyle DiVanna. Neill would resume the lead after the restart followed by Crouch, McKinney, the #8 of Kenneth Roberts and the #7 of Brad Nelson. At the line it would be Neill, Crouch, McKinney, Russ and Roberts rounding out the top five. Darby Crouch is the 2012 Red Baron Renegade Champion. The #11 of Matt Piercy was the fast timer in the NASACR Whelen All-American Bojangles Late Models, but would suffer a broken axle on the green flag. Outside pole sitter the #12 of Austin McDaniel would take the lead followed by the #1 of Pietro Fittipaldi, the #2 of Trey Gibson, the #51 of Josh Wimbish and the #77 of Jeremy Sorel rounded out the top five. Fittipaldi and Gibson began to close in on McDaniel on lap 20 as they began to put pressure on him. The top three would pull away from Wimbish as they approached half way. The battle turned to Fittipaldi and Gibson for 2 nd . Caution would fly on lap 75 for debris and set up a 23-lap battle between McDaniel, Wimbish, Fittipaldi, the #4 of Mackena Bell and Sorel. 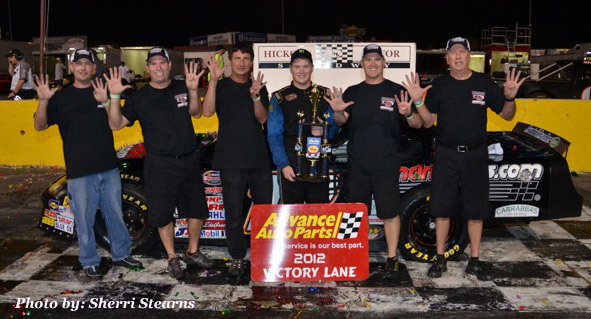 At the checkered flag it would be the 2012 Hickory Motor Speedway NASCAR Whelen All-American Series Bojangles Late Model Champion Austin McDaniel followed by Wimbish, Bell, Fittipaldi and Gibson. Rounding out the racing action for the night was the Super Truck series with the #02 of Jason Cochran taking the pole position. Caution would come out early for the spin of the #05 of Jeff Byers. Cochran would go on to take the win and the 2012 Super Truck Championship. The #03 of Chase Campbell was second, followed by the #33 of Jeremy Birch, the #27 of Trey Pitts and the #7 of Whitney Lail. Next week September 22 – The Over the Mountain 150 PASS Super Late Model Racing – Time Trials @ 4:30pm and Racing Action @ 6pm. Saturday – September 29 – 2012 Pepsi Fall Brawl Presented by Gold King – Bojangles Late Models – 200 laps, Paramount KIA Limited Late Models – 50 laps and Red Baron Renegades – 30 laps. Tickets: Adults $15 – Teens/Seniors $10 – Kids 12 and Under Free.